Portion of Map of the City of Los Angeles by H.J. Stevenson (1884). 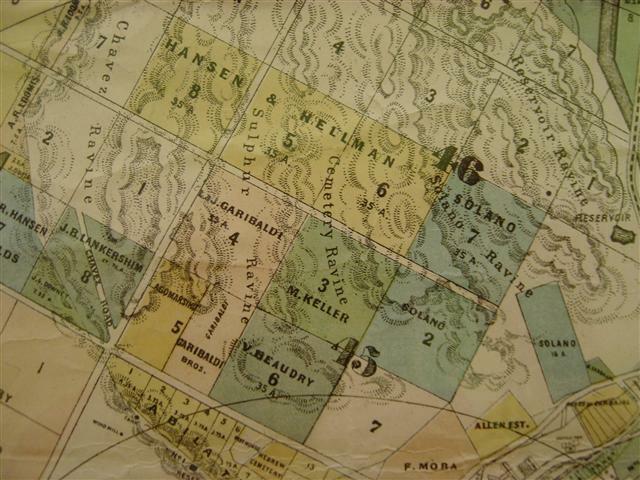 One of the only true plat maps of the area, it shows the division of land into blocks (large numbers) and 35-acre lots (small numbers), and it contains the names of early settlers, many of whom are familiar today as place names in Los Angeles history. “Solano Canyon is set on the rolling hills of Elysian Park, with broad vistas of downtown Los Angeles. This historic community is the last remaining neighborhood that bordered the Chavez Ravine neighborhoods of La Loma, Palo Verde, and Bishop. Although divided by a ridge, Solano Canyon ﻿residents ﻿considered the Ravine residents to be their neighbors and friends, and many were distraught when the community was torn down in the late 1950s. Today the ridge is gone, swept away by bulldozers to clear a road to Dodger Stadium; but the Solano Canyon community remains as one of the last great neighborhoods of Los Angeles. “The community boasts a top-notch elementary school, its own Mission Church, and a community garden. It is home both to long-time and new residents that include artists, city workers, musicians, teachers, filmmakers, professionals, and writers. The community’s neighbors include the Los Angeles Dodgers, the Los Angeles Police Academy, historic Chinatown, and Echo Park.